In today's chaotic information environment, it is a challenge to find organized, comprehensive, yet concise geopolitical information designed especially for student research. 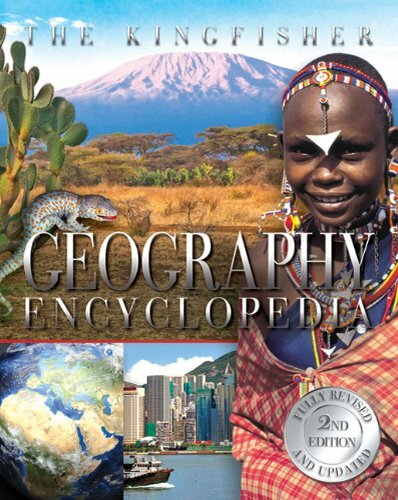 This fully-updated edition of the award-winning The Kingfisher Geography Encyclopedia by Clive Gifford is a meticulously researched and visually exciting guide to the essential geographical, physical, and cultural information of the entire world. Illustrated with more than 1,500 photographs and specially commissioned computer-generated maps of every country using the latest satellite data, this one-stop reference will help children acquire essential geographical knowledge and expand their understanding of how people live in different parts of the world. The country-by-country layout makes finding information easy, and quick reference panels give key facts on each country's population, currency, language, major cities and other data. An extensive website list and comprehensive index insures the most up-to-date resources and material for further research. An essential addition to any home or classroom, The Kingfisher Geography Encyclopedia puts the world at everyone's fingertips.